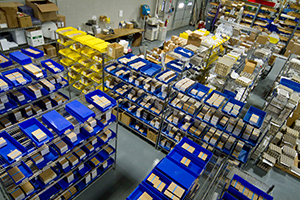 Kitting is providing customers with all the components on a Bill of Material (BOM) packaged as needed and shipped to their assembly sites all over the world. CSI has been working for 30 years with many trusted partners, all leaders in the high-precision component manufacturing segment, and is well-versed in the skills and expertise necessary to bring big jobs together through a comprehensive kitting process. When CSI provides your kitting solutions, all your parts and components are ready for you when and how you need them. Delivered together, on time, and in top quality. Every time. CSI’s kitting process truly is a single-solution answer to an organized production/assembly operation. Often, companies who consider outsourcing their kitting needs have already established a trusting relationship with a reliable vendor. When a vendor undertakes the kitting responsibilities, then all or some of the supply, purchasing, machining, sub-assembly, plating, and packaging concerns are taken off your shoulders. You still have control, as you set the parameters in regards to what suppliers you want used in the kitting program. CSI will also advise you on cost-saving and design-enhancing options for things like machining, plating, and packaging. Your assembly line is not the place to be discovering quality issues, which is one of the biggest benefits of having a top-quality, ready-made kit delivered to you. With a reliable kitting process in place, any quality issues have been vetted and resolved before being shipped—with all components present and working to spec—so they arrive on time and ready to be assembled. With kitting, CSI Group is simply managing the process you already have in place. We lift the burden of the “dirty jobs” off of you. You don’t have to spend your time stomping out production fires and chasing after rogue supply chain elements. When we kit for you, it frees you up to bring more creativity, productivity, and depth of knowledge to your specialty. When you use our kitting solutions, you allow for your company to discover and expand into capabilities that it might never have known it has. With CSI Group managing your kitting requirements—from purchasing and quality oversight to stock room streamlining and final sub-assembly—your kits are created efficiently and delivered complete and on time. 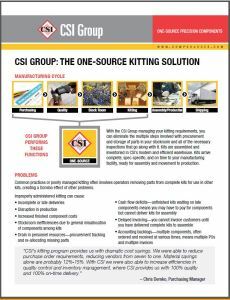 To find out more about how CSI Group can help you with your kitting requirements, download “The 1 Source Kitting Solution” now. Let’s keep the conversation going—Contact Us and let’s discuss the best kitting program for your company. Tell us what you need and we’ll work together to provide you the best 1 source solution.